Please take the time to review our most Frequently Asked Questions below. If you still cannot find an answer to your question, you may reach us by using the secure Contact Link at the bottom of the page, thank you. How can you charge so much less than everyone else? As you can see, a replacement diploma from a REAL University only costs $50, so we are not certain why other sites charge what they do. It could have to do with their overhead costs, or the time and effort that is required to create exact replicas for every school. By offering a limited number of commonly used diploma styles, we can keep our costs low while still offering a high quality product! I got ripped off by another novelty diploma site, how do I know your website is trustworthy? This website is owned and operated by a legally licensed business and has been offering affordable high quality novelty documents since 2004. If we did not deliver what we promise we would have been shut down a long time ago! What do you think about other fake diploma sites on the web? Honestly we really don't spend much time thinking about or worrying about the other sites. We have always concentrated on offering the highest quality documents for the lowest price possible, period. Are there other good sites out there? Absolutely. Phony Diploma has been around even longer than we have, so they must be doing something right. We've referred many people to Diploma Company over the years for specialty items that we don't offer and we have never had a single complaint. We're pretty certain that there are probably a lot of other sites out there doing good work too, but we just don't have first hand knowledge of who is and who isn't and don't feel it's our place to offer an opinion. What do you think about fake diploma review sites? 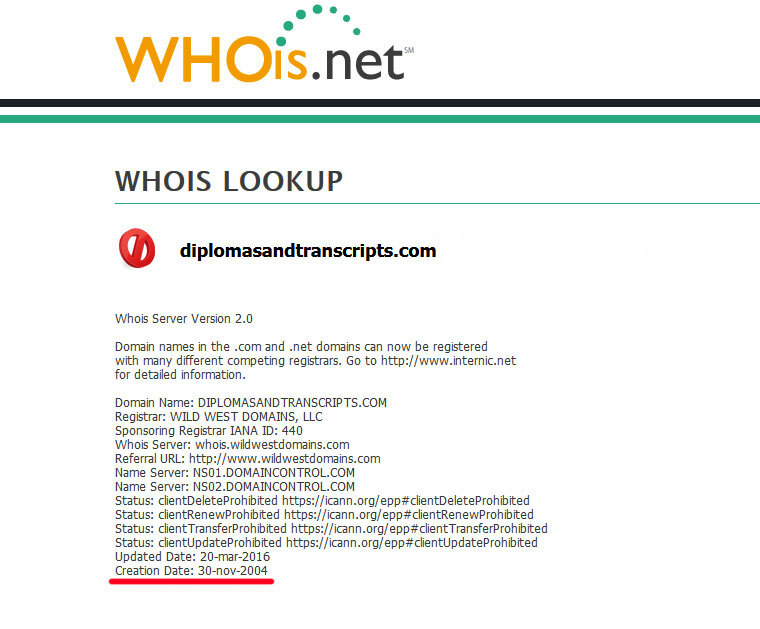 We're pretty confident that they are all owned and operated by other fake diploma sites in an effort to promote their own sites. It costs time and money to maintain a website, and we just don't see anyone doing that out of the goodness of their hearts to review sites that sell fake diplomas. One of the fake diploma review sites has so-called "customers" of ours talking about products that we do not even offer. It's downright laughable! If you want to see what people really think about us, check out the more than 500 DiplomasandTranscripts.com review emails that we have received from happy customers! Simply click on the "PLACE AN ORDER" button at the bottom of this page, select the product you wish to purchase and complete the order form. Can you make a duplicate of my diploma or transcript if I email or fax you a copy? No, we do not provide a replication service. All documents are prepared in our formats using the information you provide to us. If you absolutely require a a replica document, we highly recommend DiplomaCompany. Please note that we are not affiliated with or owned by DiplomaCompany, but we have referred many customers to them and have received very positive feedback. No, we do not ship anywhere outside of the United States. Will the package my novelty document arrives in indicate what is enclosed? No. The package label will only have your shipping address and our return address on it. There will NOT be a receipt inside the package, your payment receipt will be emailed to you when you place your order. Do your novelty diplomas and transcripts look real? We feel all of our novelty documents are realistic in appearance! Can I use a diploma or transcript I bought from you to get into college or get a job? While the documents we sell are realistic in appearance, they are NOT sold or intended for use in obtaining employment, advancing your education, or for illegal purposes of any other kind. What type of paper do you use for your novelty transcripts? All of our transcripts are printed on genuine document security paper. What color is the transcript security paper? All of our novelty transcripts are printed on light blue security paper. I don't want my novelty transcript to show that I graduated, can I get a partial transcript? Do your novelty transcripts come in a sealed "school envelope"? No. Our novelty transcripts are shipped in a 9" x 12" shipping envelope. What degrees and majors do you offer for your novelty college and university transcripts? We have coursework on file for nearly one hundred fake college degrees and majors to choose from. I don't need a transcript, I only want a novelty diploma - can I specify any degree I want? Yes, but we reserve the right to refuse any request we feel is inappropriate. Can you make a diploma or transcript in a foreign language? No, sorry, we only offer novelty documents in English. Can you do a diploma or transcript for "school name here"? Yes, you can specify any school of your choosing. Can you do a diploma or transcript for an international school? All of our novelty diplomas and transcripts are designed to look like those issued by schools located in the United States. Do you offer a verification service for your novelty documents? No, we do not. We are not affiliated with any school or government entity. Can I get a "proof" of my diploma or transcript by email? No, we do not offer digital copies. If there is an issue with your order when it arrives please contact us and we will rectify the problem. 1) There is far too much information required to place an order by phone. 2) Having everything in writing protects you if there is ever a question about whether an order was prepared the way you submtted it. If you placed an order over the phone, received it, and it was incorrect, how would you be able to prove that you said "September 17th", not "December 17th"? All customers receive a copy of the order they submit by email so they will have proof of what was submitted. 3) PRICE! One of the ways we are able to keep our prices lower than our competitors is by keeping our overhead costs low. If we had to pay someone to answer customer service calls all day, we would definitely have to increase our prices! Use of this site constitutes acceptance of our Terms & Conditions.